President Moon Jae-in on Friday called for China’s cooperation to help reduce South Korea‘s worsening fine dust pollution, which he said the neighboring country is partly responsible for. Moon made the remark during a meeting with Chinese President Xi Jinping’s envoy, State Councilor Yang Jiechi, who visited Seoul to relay the outcome of Xi‘s meeting with North Korean leader Kim Jong-un on Monday. “There is a domestic factor in South Korea’s fine dust, but China is also a factor. So there are mounting calls among our people for close cooperation between the two countries to tackle the problem,” Moon said. 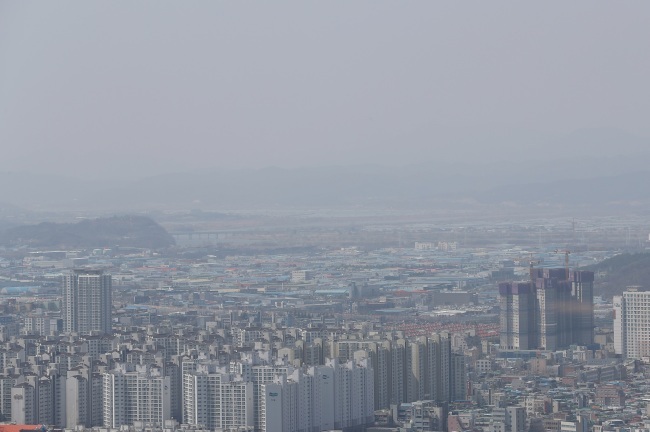 South Korea has been grappling with ever-worsening air quality caused by particulate matter both emitted at home and blowing in from China. Yang, in response, proposed to launch a joint environmental research and cooperation center as early as possible. Yang arrived here and met Moon‘s top security advisor Chung Eui-yong on Thursday. He told Chung the China-North Korea summit will contribute to the inter-Korean and U.S.-North Korea summits to be held in April and May, respectively. “We believe Kim Jong-un’s unofficial visit and summit with President Xi can help the South-North summit produce greater results,” Yang told Chung, according to Cheong Wa Dae pool reports. Moon is set to meet Kim on April 27. Chung traveled to Pyongyang earlier this month to arrange the summits. The North Korean leader was quoted as telling Chung that his country may give up its nuclear weapons in exchange for a security guarantee.